We’d love your help. Let us know what’s wrong with this preview of Moon Games by Shelly Frome. At the outset, Miranda Davis has nothing much going for her. The tourists are long gone by October in the quaint Carolina town of Black Mountain, her realty business is at a standstill, and her weekend stint managing the local tavern offers little to pull her out of the doldrums. When prominent church lady Cloris Raintree offers a stipend to look into the whereabouts of a At the outset, Miranda Davis has nothing much going for her. The tourists are long gone by October in the quaint Carolina town of Black Mountain, her realty business is at a standstill, and her weekend stint managing the local tavern offers little to pull her out of the doldrums. When prominent church lady Cloris Raintree offers a stipend to look into the whereabouts of a missing girl hiker on the Q.T, Miranda, along with her partner Harry (an unemployed features writer) agree. To ask other readers questions about Moon Games, please sign up. You might want to have a notepad handy when reading this book! The characters move at warp speed and the information hits you like a runaway locomotive. This is the first book I have read by this author and the book took some time for me to get into the groove. When I first started reading this book I wasn’t really sure what was going on or why Miranda and Harry were looking for this missing girl. There were many pieces to the puzzle and it was hard to determine what clue went where and who did w You might want to have a notepad handy when reading this book! The characters move at warp speed and the information hits you like a runaway locomotive. This is the first book I have read by this author and the book took some time for me to get into the groove. When I first started reading this book I wasn’t really sure what was going on or why Miranda and Harry were looking for this missing girl. There were many pieces to the puzzle and it was hard to determine what clue went where and who did what which is why the reader might need a notebook or whiteboard to keep track like Miranda and Harry. Miranda is the protagonist with quite a varied background. She is a realtor, manages a tavern, and plays detective in her spare time. I think she is a bit scattered which is why she needs a whiteboard to keep track of it all. I’m not quite sure why she isn’t telling those that are helping her all the details. She even admits later in the book about trying to keep straight what information she shared with Harry or Scooter. I suppose since Scooter is sort of an unknown in the equation. I will say that when I first started reading the book and Scooter came up, I thought it was a man but I was wrong. Scooter is a bit of a wildcard and I’m not sure what her end game is and what she really wants from Miranda. The clues start coming together about 60% of the way through the book and things start to make a little more sense. There were some twists I wasn’t prepared for and they helped round out the story. Right from the beginning Miranda had me going in circles. She’s disorganized and going in several directions at once. This is why I keep lists. LOL And like her, I work more than one job. This all helped me to connect with her quickly and I had some laughs as she would her way through this mystery. About the mystery. At first I was confused, not sure just what was occurring. Then, things started coming together and making sense, the suspense ramped up, some surprise twists were dropped on me and Right from the beginning Miranda had me going in circles. She’s disorganized and going in several directions at once. This is why I keep lists. LOL And like her, I work more than one job. This all helped me to connect with her quickly and I had some laughs as she would her way through this mystery. About the mystery. At first I was confused, not sure just what was occurring. Then, things started coming together and making sense, the suspense ramped up, some surprise twists were dropped on me and the mystery became something I had to solve. Wish I could have been there with Miranda. I could see us having some laughs, throwing our hands up in exasperation and putting our heads together to sort things out. I’m always a bit worried when I try a new author. Will I like their writing? Will their characters be genuine and will I be able to connect with them? Will I enjoy the plot? Shelly Frome fairly quickly put my worries to rest and I had fun reading Moon Games. He’s now on my to read again author’s list. Moon Games is the first book I have read by Shelly Frome and it definitely will not be the last. I thought it was pretty good. It is full of action, adventure, mystery and suspense. It is not one that I could easily predict. The twists and turns kept on the edge of my seat. I never knew what would happen next. I am giving Moon Games four stars. It is most definitely worth a read. I recommend it. I've just recently discovered Shelly Frome and have been working my way through his back catalog of books so that I can read them all. I love his writing style, his attention to detail and his clever dialog and descriptions. What a talent this man has for story telling and plotting. I feel like all of his books pull me in from the first page and don't let go till the last! And this one was no different, of course. 'Moon Games' begins with the exciting pretense that a young girl has gone missing I've just recently discovered Shelly Frome and have been working my way through his back catalog of books so that I can read them all. I love his writing style, his attention to detail and his clever dialog and descriptions. What a talent this man has for story telling and plotting. I feel like all of his books pull me in from the first page and don't let go till the last! And this one was no different, of course. 'Moon Games' begins with the exciting pretense that a young girl has gone missing in the Carolina mountains. Miranda Davis is probably not the first person you'd select to go on a search for a missing person. For one thing, she's a realtor and for another, she's funny and somewhat scattered. Hardly a seasoned detective who deals with these sorts of things all the time. But she gets pulled into the mystery in much the same way that the reader does and, eventually she agrees to go up to the mountain with her partner, Harry to have a look. However, there are some suspicious clues about the missing girl that don't add up. Why was a strange tarot card shoved under the door of a local church lady? Who is the huge, hulking man they see on the mountain and is he carrying the body of a woman? These are the kinds of questions that had me guessing till the last page. I love a good mystery and, once again, Shelly Frome delivers just that. I highly recommend this book to any other mystery fans, like myself or anyone who enjoys a compelling, quick read. I can't wait to read what Shelly Frome has in store for his next book! I feel like I'm becoming a huge fan of his as I go! 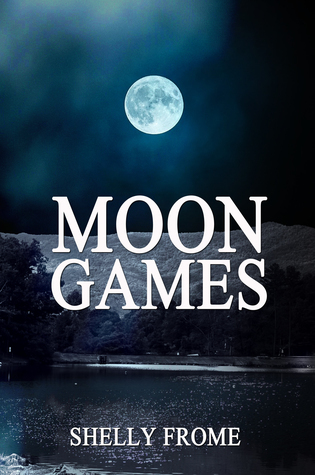 Moon Games can only be described as a dramatic, thrilling and exciting novel that will keep readers entertained, captivated and engrossed from the very first page. Mystery stories are currently my go-to read so when I read the description of Moon Games I knew that I had to read it as well as review it so that all you lovely readers could learn about it. Never before have I been so captivated by a mystery novel and this is thanks to the exceptional author Shelly Frome and his talented literature Moon Games can only be described as a dramatic, thrilling and exciting novel that will keep readers entertained, captivated and engrossed from the very first page. Mystery stories are currently my go-to read so when I read the description of Moon Games I knew that I had to read it as well as review it so that all you lovely readers could learn about it. Never before have I been so captivated by a mystery novel and this is thanks to the exceptional author Shelly Frome and his talented literature and so, if you are a reader who loves mystery and suspense reads then you will adore this adventure as it is stellar! Moon Games is an exceptional novel that will introduce the reader to the protagonist of the book, Miranda Davis. Miranda lives in a quaint town in Carolina, and it is here that she has a business. The reader will follow Miranda as she is approached by Cloris Raintree, a church leader who offers Miranda help in exchange for her help. What does Cloris require from Miranda? Cloris wants Miranda to help find a girl who went missing hiking and so Miranda does just this with the help of a few people close to her. As Miranda investigate the strange disapperance, more shocking truths are revealed and this book lovers is the premise of the sensational Moon Games. Moon Games shocked me from the start because although I thought I knew where the book was going to go, it didn’t go that way and instead took a U-turn and wow it was shocking! The themes combined and laced throughout Moon Games perfectly compliment the atmosphere of the book and story; the reader will experience mystery, action, terrifying and thrilling moments and many more exceptional themes. As I read Moon Games, I found myself racing through it, turning the pages with haste thanks to the addictive nature. What I loved the most about Moon Games is that it was not a silly mystery novel in which the author has to rely on gimmicks. Instead, the story is unique and has the perfect combination of crime, suspense, and mystery which are all perfectly weaved together by the exceptional author, Shelly Frome. Moon Games is excellent and incredibly well-developed thanks to Frome as he manages to develop his world with immaculate detail; every event, character, and setting is well thought out and planned, and I was impressed by Frome’s flawless ability to do this. As I read Moon Games, I immediately was drawn into the book and felt captivated by Frome’s spellbinding literature. Frome’s writing is detailed in the most immaculate of ways; the text is detailed but not too dense, it is beautifully written so that the reader will be able to immerse themselves in the story from beginning to end without difficulty. Shelly Frome is an incredible author who has written a fantastic story and come up with a brilliant idea. Frome from the very start sets the tone of the novel; he lets his readers know that this is going to be a dark and atmospheric book thanks to his literature and wow was it! Frome is an exceptional writer because he grabs his readers attention from the start very quickly and keeps them engrossed until the end. There are no long build-ups that drag in Moon Games; instead, the reader will be thrown into the thick of the story quickly, and the result of this is exciting (and slightly terrifying!). Since I live in the town where this tale is set, I found it immensely fun to read. I also liked the strong female lead character, Miranda. She never gave up, despite set backs and people who were slow to believe her hunches and evidence. Good read!